This post is sponsored by MacKenzie-Childs. As always, all opinions are my own. This Friday is #NationalBestFriendsDay. I'm not one to normally celebrate these little holidays, but I thought this one deserved some recognition. I was recently on my trip to Aurora, NY with MacKenzie-Childs and the trip was themed around celebrating our best friends. We made stationary and painted pottery to mail to our best friends back home. One thing I LOVE about the brand is their products are created to be shared. In fact, my best friend Cookie was already familiar with the brand because her mom shared it with her. Read all the details about our amazing trip and why I love the brand so much here. Here's a little backstory on my best friend Cookie. We have been friends since fifth grade and it's crazy to think about how many different stages of life we've been through together. From my boy crazy middle school days to figuring out who I was in high school... all the way to wild weekends visiting me in Oxford in college and standing by my side on my wedding day. She has truly seen and been there for me through it all. My trip to Aurora got me thinking about how lucky and thankful I am to have such an amazing and supportive best friend. Last week we got together for a picnic in my backyard and chatted about life and all that's going on in our lives. It's SO important to make time in your schedule for the people who matter most. 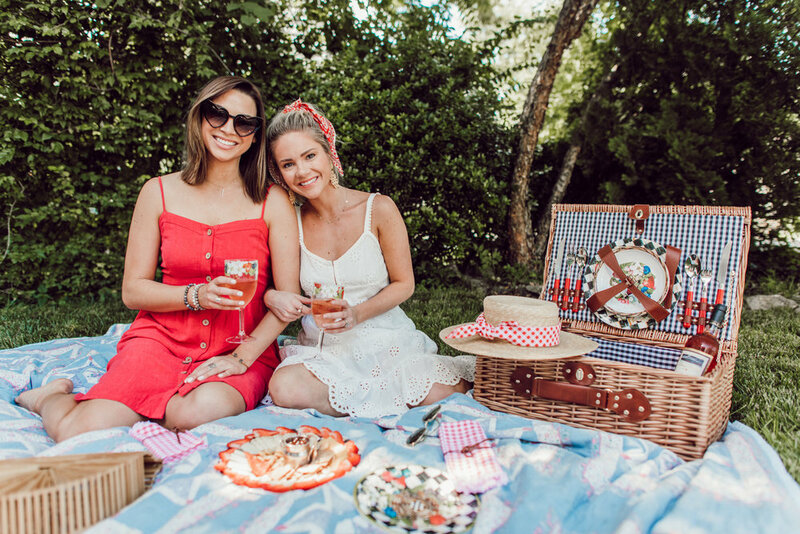 How adorable is this MacKenzie-Childs Picnic Hamper?? It’s even more beautiful in person. It comes with everything you need for a relaxing afternoon: a leather wicker basket, dinner plates, napkins, wine glasses and more. It makes the perfect gift for a friend (or yourself!) and gives you an excuse to unplug and sip rose on a Sunday afternoon like we did. :) Below I'm sharing 8 things I've learned over the years from my friendship with Cookie. Present is better than perfect. You can always be yourself with a true friend and show up exactly how you are. You don't have to clean the house, pretend to be in a good mood, or put on any fronts. As an only child, this was something that took a long time for me to learn and I'm so thankful to have a friend who makes that so easy. Any situation can be turned around with a little humor. Things aren't always perfect. Having your best friend around to take the stress off by seeing a silly movie or just talking a walk around the block can mean everything. It’s easy to get caught up in what’s wrong and not see how much is right in your life. Best friends are there to remind you of all the good even when things aren't going your way. Friends can turn into family. Being an only child, Cookie is definitely the closest thing I have to a sister. I didn't mind being an only child growing up, but as you get older you realize the importance of siblings. I'm super thankful to have a friend that feels like family who will always meet me exactly where I am and listen without judgment. Always make time for each other. This might be one of the most important things I've learned over the years. No matter how busy you may get in your life, you always have to make time for the people who matter most. 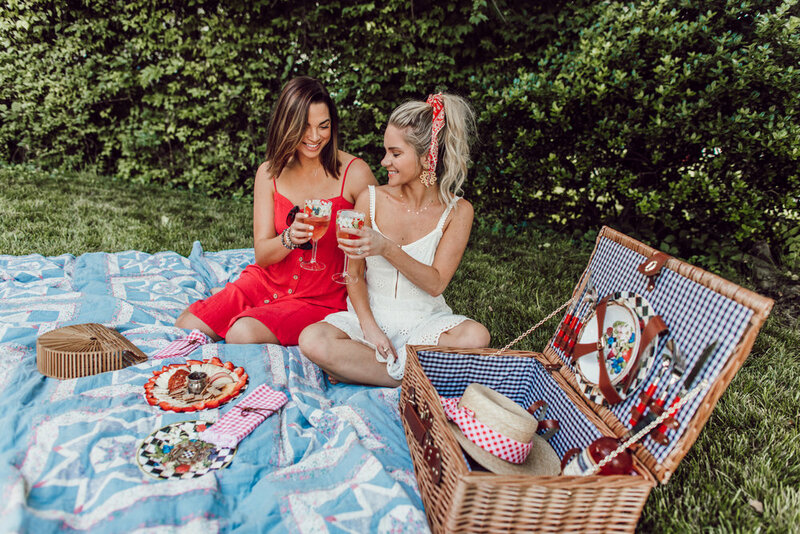 Even when you feel like you’re too busy, chances are a conversation or a glass of wine with your best friend will make you feel a lot less overwhelmed by everything else going on in your life. A phone call can fix everything. I can't tell you how many times a week (or sometimes a day) I call Cookie. Sometimes it's to tell her something funny that just happened, other times it's to vent about something that made me mad. No matter what, she always offers a listening ear and advice when I need it. I might be the world's worst texter, but I'm still a firm believer in a good ole phone call. Change is good. Over our 14-ish years of friendship, we’ve seen each other change a lot. Being friends means growing together in order to accommodate new growth and progress. Friendship can change you for the better and I am grateful for all that we've experienced that put us where we are today. Life moves fast, so enjoy every moment. So pick up the phone and call your best friend this week. Make sure to tell them how much you appreciate them. What lessons have you learned from your best friend? Leave them in the comments below.